Hey look, Lookanotherblog is on new hosting. Can’t tell a difference? Exactly. Well, except for the shinny pad lock icon in your address bar. I decided it was time to finally jump ship from GoDaddy after 7 years. Everybody loves to hate on GoDaddy since it is one of the largest web hosting services on the Internet. There’s also arguments they are anti-competitive when trying to leave. I never had major issues with their services and getting my domain unlocked and moved over to Namecheap.com was painless. For hosting I’m on HawkHost.com. There were two big draws to this fairly new hosting service. 1. Support for Let’s Encrypt. 2. Unlimited domains/databases/bandwidth for their basic shared hosting package. Now I can run the site under the root domain and my TT-RSS instance under its own subdomain. That’s all there is for now. A new year, a new look. I’ve was running the same theme on this site for over 5 years and decided it was time for new paint. I know the default Twenty Sixteen theme from WordPress is nothing to look at, but it does feel modern compared to Fusion. I’ve also decided to switch the comment system over to Disqus. I see several large sites using it and I’ve enjoyed it as a end user. Recently I took the opportunity to upgrade my home server from a heavily upgraded 2001 Quicksilver PowerMac G4 to a PowerMac G5. With that I took the opportunity to reinstall OS X 10.5 on the Quicksilver and turn it into web browsing station for when I’m in the basement working on projects. The main limitation I had with this was network connectivity. I could have run a network cable from the 1st floor office through the basement to the work area, like I did for the living room, but thought it was a little overkill. With the basement ceiling have interlocking tiles I also didn’t want to fight with them. The next logical conclusion was wireless, but that had its own challenges. The G4 PowerMacs never officially supported wireless above 802.11b. Today 802.11b has two major disadvantages compared to every other wireless standard used: it is slow at only 11Mbps theoretical throughput and only the only encryption it supports is WEP. While 11Mbps of bandwidth is enough for simple surfing the WEP security is a big problem. The security protocol can be easily cracked using only a few MB of passively collected data and 5 seconds of compute time. Seriously: https://en.wikipedia.org/wiki/Wired_Equivalent_Privacy. So using an original Apple Airport card was out of the question. I could have created a separate wireless network off my DD-WRT router that used WEP and isolated the traffic from the house, but I felt that was still too much of a security risk. Instead I started looking into PCI or USB wireless cards that still worked with PPC OS X. I was surprised to find that may be multiple products that worked. Turns out Realtek made drivers for many of the RTL81XX series wireless chips going back to OS X 10.4 PPC. So all I had to do was find a wireless adapter with one of those chipsets and I would be set. Searching Amazon.com turned up dozens of results and I chose to go with a Bolse BO-N1557 USB adapter. The unit was small, built on the RLT8192CU chipset, and supported 2.4GHz 802.11n and therefore WPA2 encryption. $15 and 3 days later I received the adapter and got to installing it. Years ago I had purchased a USB 2.0 PCI card during the CompUSA closeout and was happy to see it was plug & play in the PowerMac. It only made since to plug the USB adapter into the USB card rather than the USB 1.1 ports. Installing the drivers was easy and straightforward with no major issues. The only challenge with using Bolse card was the configuration. It looked like Apple never allowed third party manufacturers to tie into the wireless features of OS X. That meant the wireless card showed up as a wired network connection to OS X and the Realtek driver utility had to be used to configure connections to wireless networks. The process wasn’t as smooth or hassle free as the built in OS X process, but was doable. So there you go, if you have an old PPC Mac and you want to add some modern wireless connectivity, check out the dozens of wireless adapters built on the Realtek RTL8192CU chipset. Fun Fact: Internally the original Apple Airport cards were WaveLan Silver/Gold PC Cards only without the built-in antennas. In fact, you could take a WaveLan card, plug it into the Airport slot of a PowerMac or PowerBook and it would show up just like an original. You couldn’t close the case because the card stuck out too far, but you at least had wireless connectivity. The WaveLan cards were also used in the original Airport base stations before Apple swapped over to Airport cards. You know that person who is constantly changing the theme of their blog? I think I’ve turned into that guy. I’m playing around with different themes trying to find something simple and easy to read. Sorry everybody, the current theme, Fusion, may not be the last. I just found out today the website was down due to an error caused by the WordPress Mobile Pack plugin. It was nice to be unable to access any part of the site. But, now I’m back up and have to say thanks to Jeff Starr and his blog, Perishable Press. He had a great article explaining how one can disable WordPress plugins from withing the site database. Learning the ups and downs of W.I.N.E. That should be enough to keep me occupied for a few months… I hope. OH, I didn’t announce it but I setup a photo gallery accessible from the link at the top of the page. Rather than have Yahoo or Google host my photos I thought I would do it myself. And now that winter is over in KY (hopefully) I can get back outside and enjoy some hiking trails. I am happy to report that Look It’s Another Blog is now compatible with mobile browsers. 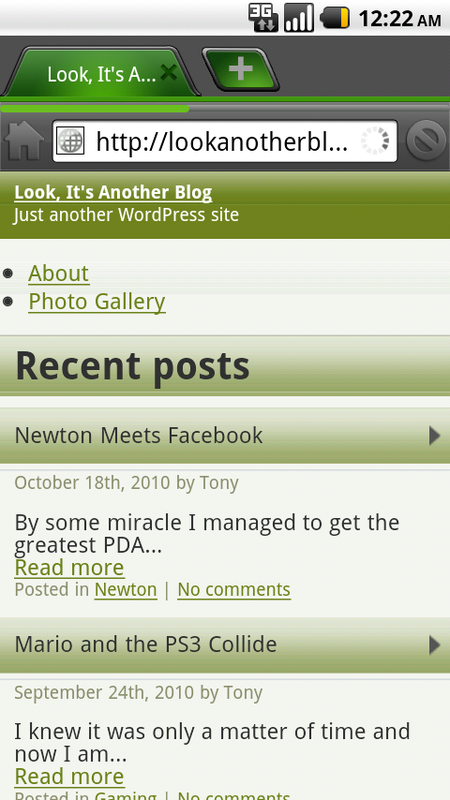 This is thanks to the WordPress Mobile Pack plugin, which provides a simplified theme along with some PHP scripting. WPMP has a list of browser user agents known to be used on mobile devices. If one of those browsers connects to this website then the mobile version will load. If you would like to view the full version of the site then not a problem. There is a link at the bottom of the page to switch back and forth. The website will remember your preference in the future. 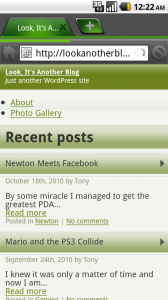 For all of you out there who are surfing the web with an Apple Newton and the Netwscape browser, WPMP will choose the mobile version of the site for you. Currently I can not get Net Hopper to connect to Look It’s Another Blog. It doesn’t appear to like the fact Go Daddy is the host. Courier will load the full site. In testing it does not send a user agent to websites. Therefore, websites do not know what type of browser is connecting. And in case you were curious, here are the user agents for Newtscape and Net Hopper. Welcome everybody. If your reading this then you have stumbled upon another one of the millions of blogs, which exist on the Internet. But what makes this blog different? Nothing. It’s just a place to share ideas and opinions on anything I see fit. Who knows, maybe you will learn something.